MicroWorld lenders may have noticed that rice farming is a common occupation of the Cambodian borrowers on the website. Loans for fertilizer and other items designed to improve crop yield are common requests. Many borrowers talk about dry and wet season harvests, the affects of the recent floods on their crops, and their need for machinery or livestock to help with their work. We wanted to help our lenders gain a deeper understanding into the industry that is the backbone of Cambodian agriculture, so we asked Sokchea Huot, MicroWorld Correspondent at our Cambodian partner microfinance institution (SAMIC), to put together this article for us. We hope it will give more context to some of the loan profiles you see on the site. Rice farming practices vary considerably between the rain-fed lowlands, uplands, deepwater, and irrigated areas. 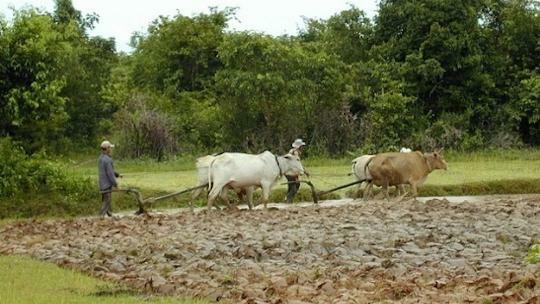 Most of the rice-growing land in Cambodia is cultivated by farmers using two oxen and the traditional moldboard plough and harrow. In the rain-fed lowland areas, the majority of the fields are ploughed using two oxen when the soil is wet or flooded. This normally occurs in May or June. The soil is ploughed to a depth of 70-100 mm and, depending on soil conditions, may need to be ploughed again 3-6 weeks after the initial working, after which the fields are normally harrowed. In floating rice areas, fields are ploughed from February to May. Where the soil is not cultivated by harrows or ploughed after scattering seeds, birds and rodents tend to eat a large percentage of the seed. In the irrigated areas, the soil is often easier to work with because of higher moisture content. When animals are used, the fields are worked as soon as possible after harvesting or, if the soil is dry, the fields may be flooded prior to working. Tractors are preferred as the task can be accomplished much faster. Animal ploughing: Oxen or buffalo are still the most popular power source for land preparation and transportation. One pair of oxen/buffalo can be purchased for approximately $1,000. Buffalo are preferred in the irrigated areas as they are considered to be stronger than oxen, but they are also more expensive. Four-wheel tractor ploughing: Four-wheel tractors are used in Cambodia, but tend to be out of reach in terms of price for most farmers. The price of a new tractor is generally more than $10,000. Repair and maintenance of the tractors is also a major problem, especially if the local suppliers do not have spare parts. Hand-held walking tractors: Hand-held tractors were imported from Japan, Thailand, and China for use in Cambodia, and have a work capacity about 4-5 times that of a pair of oxen. However, farmers complain that these machines require as much energy to operate as traditional methods, and that their price is too high. A hand-held walking Tractor, known as Kor Yun by Cambodian people, costs from $4,000 to $10,000. Many farmers lack the necessary funds to be able to invest in a pair of oxen, a tractor, or a walking tractor, and so approach their local MFIs, banks, and other sources to request a loan. If they do not have enough funds to buy them, and are unable to access credit, they will need to rent the items from their neighbours. However this is an expensive option, as the items will be needed for extended periods of time. SAMIC has provided many loans to the clients to buy oxen and hand-held walking tractors that enable them to own their own sources of power for their rice farming. All rice crops are manually planted by either transplanting them from a nursery, which usually takes up 15-20% of the farming area, or broadcasting (scattering over a wide area). The planting techniques that used by farmers depend on the locality as well as on the rice ecosystem. Transplanting is the more common of the two methods, because broadcasting can only be done in the rain-fed lowland areas of the country, and it generally gives a lower output than transplanting. Transplanting, however, is very labour intensive, requiring between 30-40 person-days to establish 1 hectare of rice. If a family does not have enough members to do this work, they will need to hire workers from the surrounding area to help them. This is another common reason for taking out a microloan, which the farmer will repay after the harvest. Farmers manually weed their fields and also use chemicals to control the weed. Most of them use pesticide to control the pests which damage their crops. Apart from using their savings, loans are often the best way for them to finance these purchases. This is an important stage in rice farming. Besides using animal manure, most farmers use fertilizers for their nurseries and their fields. All fertilizers are applied manually. Farmyard manure is transported by animal-drawn carts during the dry season and placed in strategic piles in the fields. Spreading is done by water movement and during land preparation. Inorganic fertilizers are hand-spread and, where necessary, incorporated by harrowing. Some farmers buy their fertilizer during the early part of the farming season to access lower prices. Some rice-growing areas in Cambodia are irrigated during the dry season to enable farmers to plant rice two or three time per year. The use of irrigation systems has been increasing in recent years. However, many farmers will still need to pay to pump water into their farm area, as they may be some distance from the main water channels. Crops are manually harvested and tied into sheaves. These sheaves are placed on top of the standing stubble or transported to a central threshing site where they are dried for 2-3 days. Depending on locality, threshing is done at a central site in the field or in the village. A small number of farmers own mechanized cutting or gathering machines, but this is rare due to the high cost of such a machine. Sheaths are laid on the roadway so that they are run over by passing vehicles. Hand-threshing is done using a board against which the stools are hit. Threshing is done on a hard floor using either animals or machines to walk or drive over them. Mechanical threshers may be used.